ETG-6 Skid Steer Loader Mounted Brush Grapple 72"
Model C433D58 is the contractor series grapple rake designed for everyday heavy use. The rake is made from 5/8 inch thick GR50 high strength steel. 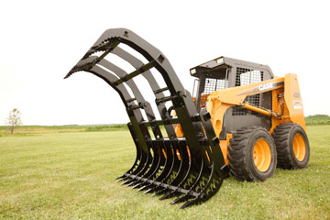 The rake is designed to fit larger tractors (75 to 100 hp) and skid steer loaders (2000 to 2700 lbs. lift capacity). The units are available in either single or double grapples in 58 inches, 72 inches, and 85 inches wide. Quick attach brackets and couplers are sold separately. Comes complete with hydraulic cylinders, cylinders are concealed for maximum protection, cylinders are fully plumbed with hose protection.